Originally nearly seven feet tall, this is surely one of the most beautiful and moving images in any medium of Avalokiteshvara, the Buddhist bodhisattva, or saintlike being, of compassion. 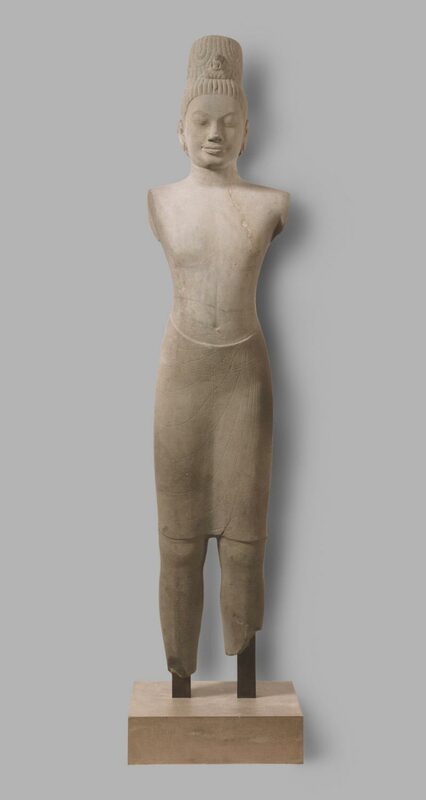 The sculptor has given the body, which is modeled in the round except for the simple garment that is carved in low relief, a taut smoothness achieved by means of its highly polished sandstone. The small image of the Buddha at the front center of the elaborate chignon identifies this images as Avalokiteshvara, but the spirituality of the deity is transmitted through the face: the high forehead and nose, perfectly arched eyebrows, downcast eyes, and serene smile convey a sense of majesty, wisdom, and repose. One can only imagine the effect the sculpture would have had in its original setting, and even now it allows us a glimpse of the eternal through its subtle, understated monumentality. Felice Fischer, from Philadelphia Museum of Art: Handbook of the Collections (1995), p. 62.